To claim this profile, please confirm you are Kylie Morris. To follow this profile, please let us know your relationship to Kylie Morris. Kylie's basketball stats have been updated for the loss vs. New Hope Academy. RESULTLoss Girls varsity basketball vs. New Hope Academy. 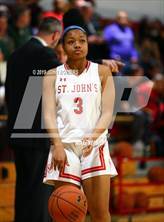 The St. John's varsity basketball team lost Saturday's neutral tournament game against New Hope Academy (Landover Hills, MD) by a score of 45-34. The St. John's varsity basketball team won Friday's neutral tournament game against Centennial (Las Vegas, NV) by a score of 63-61. RESULTWin Girls varsity basketball vs. GVP. The St. John's varsity basketball team won Sunday's neutral playoff game against Georgetown Visitation Prep (Washington, DC) by a score of 63-38. This game is part of the "2019 DCSAA Girls Basketball State Tournament - Class AA Tournament". Kylie's basketball stats have been updated for the win vs. Maret. RESULTWin Girls varsity basketball vs. Maret. The St. John's varsity basketball team won Friday's neutral playoff game against Maret (Washington, DC) by a score of 76-45. Kylie's basketball stats have been updated for the win vs. Anacostia. RESULTWin Girls varsity basketball vs. Anacostia. The St. John's varsity basketball team won Wednesday's home playoff game against Anacostia (Washington, DC) by a score of 77-36. RESULTWin Girls varsity basketball vs. Bishop McNamara. The St. John's varsity basketball team won Monday's neutral playoff game against Bishop McNamara (Forestville, MD) by a score of 66-51. RESULTWin Girls varsity basketball vs. Bishop Ireton. The St. John's varsity basketball team won Sunday's neutral playoff game against Bishop Ireton (Alexandria, VA) by a score of 53-38. Kylie's basketball stats have been updated for the win vs. Our Lady of Good Counsel. RESULTWin Girls varsity basketball vs. OLGC. The St. John's varsity basketball team won Saturday's neutral playoff game against Our Lady of Good Counsel (Olney, MD) by a score of 65-41. The St. John's varsity basketball team won Monday's home conference game against Our Lady of Good Counsel (Olney, MD) by a score of 68-30. Kylie's basketball stats have been updated for the win @ Bishop O'Connell. RESULTWin Girls varsity basketball @ Bishop O'Connell. The St. John's varsity basketball team won Friday's away conference game against Bishop O'Connell (Arlington, VA) by a score of 65-48. RESULTWin Girls varsity basketball vs. TAHC. The St. John's varsity basketball team won Wednesday's home conference game against The Academy of the Holy Cross (Kensington, MD) by a score of 77-56. RESULTWin Girls varsity basketball @ Seton. The St. John's varsity basketball team won Tuesday's away conference game against Seton (Bladensburg, MD) by a score of 59-43. Kylie had 4 photos tagged from the game against Bishop McNamara. The St. John's varsity basketball team won Saturday's home conference game against Bishop McNamara (Forestville, MD) by a score of 64-58.